In order to teach loose leash walking, some people like to stop when the dog pulls (sometimes called "tree or "red light green light"). While this method is certainly better than yanking a dog around on a choke chain or prong, the tree method does have some pitfalls that pet parents should consider. 1. We are setting the dog up for failure. Utilizing tree means that we have to wait for the dog pull in order to teach him to not pull. It's better to teach what we want vs teaching what we don't want. 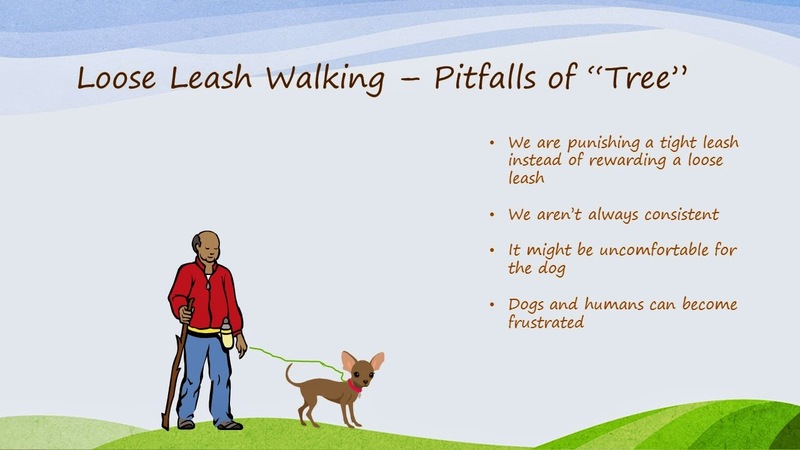 And it's better to reward a loose leash vs punishing a tight leash. 2. The dog is practicing an undesirable behavior (pulling). When trying to reduce an undesirable behavior, the more we can prevent it, the less chance that it becomes a habit for the dog. 3. Pet parents also have to be very mindful that the dog is actually stopped when she/she starts pulling. Dr Sophia Yin’s “How to Behave So Your Dog Behaves” has a good illustration on page 138. If you stop but your arm continues forward when your dog pulls, your dog has still rewarded him/herself for pulling. This could be problematic for pet parents who walk large and/or strong dogs. 4. Large/strong dogs can also rock the human's body forward even if the arms are locked. 7. Some humans stop some of the time and continue forward other times. 8. If pet parents aren’t careful, they can fall into a pattern of stopping, then walking, then stopping, etc..
After considering some of the pitfalls, if pet parents choose to use the tree method, here are some things to consider. 2. Be consistent. Stop every time the dog pulls, and never go forward when the leash is tight. Plan to not go far in the beginning. 3. If the dog doesn't seem to be getting it or if you or the dog get frustrated, try another method.